WASHINGTON, D.C. -- As the first president in Gallup's polling history to start his term with a job approval rating below the majority level, Donald Trump has already received the all-time lowest approval ratings of any president in his first year. Trump's recent 36% approval rating, recorded after Republicans in Congress failed to repeal and replace Obamacare, fell just below Bill Clinton's all-time low of 37% in June 1993. In interviewing conducted Sunday through Tuesday, Trump has dipped further to 35%. Trump arrived at this point after a sharp slide from a 41% approval rating last week, and from 45% recorded earlier this month after his well-received State of the Union address. He previously descended into the 30s with a 38% rating in mid-February and a 37% in mid-March, but bounced back each time. All seven elected presidents since Richard Nixon saw their job approval rating descend below 40% at some point during their tenure. Of these, four had ratings below Trump's 35%, including Nixon (24%), Jimmy Carter (28%), George H.W. Bush (29%) and George W. Bush (25%). Ronald Reagan's lowest (35%) matches Trump's, while Clinton (37%) and Barack Obama (38%) had low points slightly above where Trump is now. 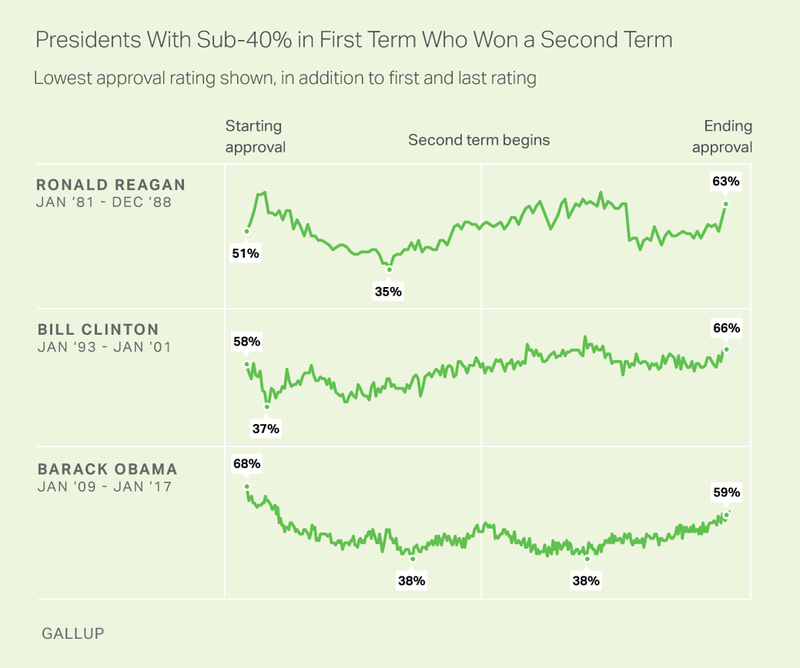 Three presidents -- Reagan, Clinton and Obama -- all hit their presidential low points in their first term, yet recovered in time to win re-election. Of the three, only Obama returned to his low point in his second term; however, he enjoyed a second recovery period and finished his presidency with a 59% job approval rating in Gallup's final reading in January. The paths of two other presidents -- Carter and George H.W. Bush -- should be more troubling to Trump, as neither won a second term once his approval rating fell into the 20s during the first. Carter hit his lowest point in the third year of his presidency. Following a brief rebound after the Iran hostage crisis in late 1979, his approval retreated into the 30s ahead of the 1980 election. George H.W. Bush reached his lowest point in his fourth year, just months before the 1992 election, although he did see a bounce to 56% approval after the election. 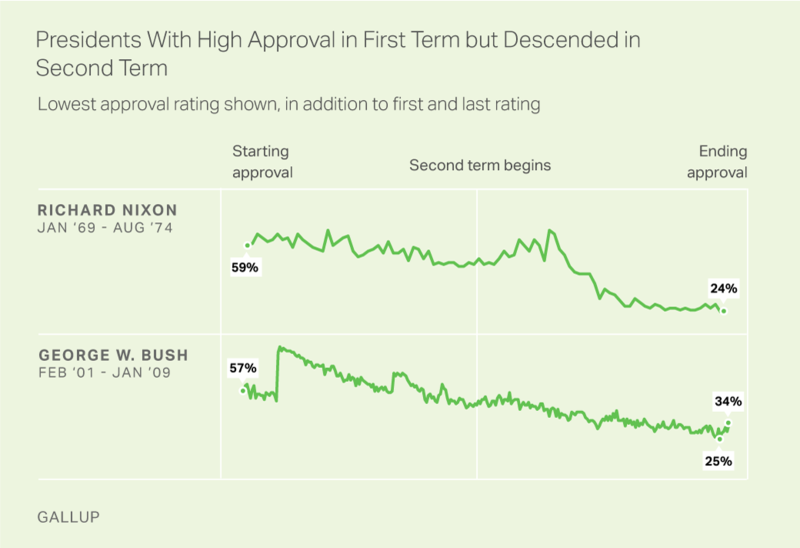 Both Nixon and George W. Bush hit their low points -- significantly lower than Trump's current level -- well into their second term after enjoying broad popularity in their first. Bush limped out of the White House with a 34% job rating, while Nixon never finished his second term, choosing to resign rather than face likely impeachment and removal over the Watergate scandal. Already a trendsetter by earning the lowest initial job approval rating of any president and falling below 40% approval in record time, Trump's recent 35% and 36% approval ratings are the lowest of any president in his first year. Three two-term presidents -- Reagan, Clinton and Obama -- dropped below 40% approval in their first term. However, it is unusual for a president to cross that threshold in his first year (Clinton is the only other example), much less in his first month, as Trump did. One possibility for Trump, following Clinton's path, is that after bottoming out somewhere in the 30s early on, he learns from the school of hard knocks and improves his performance enough to rebuild public support. His challenge will be expanding beyond his 46% high point -- if he does, he could be in a good position for re-election. The alternative is that he sinks into the 20s and follows the path worn by Carter and George H.W. Bush: straight to the first-term exit door. What ensues will depend not only on Trump's management of his administration and relations with Congress, but also on his relationship with the media and, possibly most importantly, real-world economic and national security conditions that Trump can only partly control. 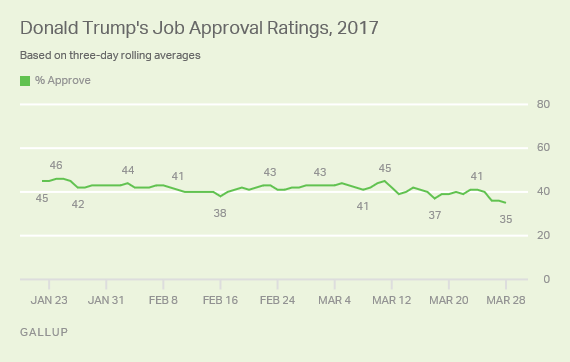 Results for Trump's latest approval rating are based on telephone interviews conducted March 26-28, 2017, on the Gallup U.S. Daily survey, with a random sample of 1,519 adults, aged 18 and older, living in all 50 U.S. states and the District of Columbia. For results based on the total sample of national adults, the margin of sampling error is ±3 percentage points at the 95% confidence level. All reported margins of sampling error include computed design effects for weighting. President Donald Trump's job approval rating fell to 36% over the weekend after Republicans' failed effort Friday to repeal and replace Obamacare.